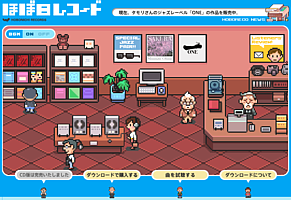 About a year or two ago, Itoi’s company set up an online music shop on his site. 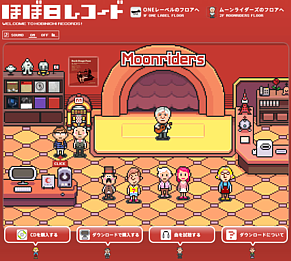 It was well-crafted and made to resemble a shop a lot like you might find in MOTHER 3; Itoi even went so far as to hire one of the Brownie Brown artists who worked on MOTHER 3 to do art for the music site. The shop primarily sells jazz music, and you can check it out here. It’s pretty nice, and if you look closely, you’ll even see a few MOTHER series items in the shop! Just recently, a new “floor” was added to the online shop, this one specifically for Moonriders music. If you don’t know, Moonriders is the band Keiichi Suzuki is in, Keiichi Suzuki being one of the main music composers for the MOTHER series. You can see the new floor here. And like last time, there are little MOTHER-related things scattered around the store. See what you can find! Itoi and the Moonriders have done stuff in the past, most notably is this music video starring Shigesato Itoi. I guess this new store floor is related to Keiichi Suzuki’s recent visit to Itoi’s office too. Really neat stuff! I spotted the Clayman on the first floor, and a Starman, Mr Saturn, Sky Runner,and one of the UFOs on the second! Good find Mato! – One of the CDs on the leftmost shelf has Lucas & Claus on it. – There’s a toy Clayman on the shelf behind the counter. – A toy Lil’ UFO and Starman on top of the leftmost shelf. – A toy Sky Runner is on the counter. – A toy Mr. Saturn on the shelf behind the counter. – That jukebox looks familiar, but I cannot pin it down exactly. – The man with the headphones on… I think I’ve seen him (or someone with a very similar head) in Mother 3. I remember when you posted the first floor ages ago. And then I tried to figure out how to buy stuff from it. I got as far as setting up an account of some sort to buy stuff from the store, but then my bank (or some sort of ungraspable force) kept my payment from going through… Then I found that the CDs that were up there at the time were available on iTunes and went for it there. What about that clock on the first floor? Isn’t that the one from EarthBound? Heh, that’s nifty. I’ll try to point out the things I spotted. MOTHER 3+ on one of the shelves. Clayman plush on the right-hand side. That could possibly be a teddy bear from EarthBound ontop of the shelves. Mr. Saturn on the right. L’il Saucer ontop of the shelf. That music playing the background is quite catchy. It’s great to see little things hidden on Itoi’s websites like this. Do you think he requested those knickknacks, or did the Brownie Brown team decide on all the little touches? Or maybe it’s just Toyko Tower… slightly disappointing! Was it Itoi’s inspiration for Thunder Tower? Is that Biff in the Moonriders floor? The two in the front look like older versions of Lucas and Kumatora…hmm. Oh, I saw that while it was “under construction” a couple days ago. There was a Mother 3 present box in place of that Mr. Saturn, from what I recall. Oh come on! You can’t click on the mini mother 3+ album! First of all, for the past while you’ve been an annoying pushover ever since you got your update, second of all quit using capitalization, you’re practically spamming, third of all WTF are you talking about? Fourth of all, quit posting such absurd nonsense…. You can’t reprogram a GBA ROM cartridge (ROM = Read Only Memory). 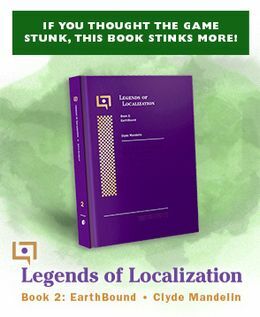 People also call the GBA game on the computer ROMs because they are essentially a data dump from the ROM chip on a game cartridge. As a file, it may be modified, as Mato did with Mother 3 (the UPS patch that you download from the web site tells the patching program how to modify the original ROM file to make it match the hacked and translated game that he made from the ROM). However, you can’t put the modified data back onto a cartridge. People can create a pirated cartridge from a ROM, but that requires making the circuit board and using a flash memory chip (which is modifiable memory). If you want to play Mother 3 on the original hardware, you will want to get a flash cart, which is a special cartridge that allows you to load ROM files onto it. Then you connect it to your GBA console (or DS, but not DSi) and the hardware reads the game data from the flash cart as if it was a regular ROM-based cartridge. Naturally, the flash cart also has a game save area. Google to see where you can buy a GBA flash cart if you are interested. okay, thanks santiagoff, also you hate me don’t you? also, thanks blahmoomoo, but don’t flash carts function like emulators in a sort of way? (can break down and get glitchy and not work etc.) but I guess a flash cart is the closest that I can get…. It really depends on how good a flash cart you get. It doesn’t emulate, it just serves the game data to the GBA and has the ability to save games, plus some extra features (including multiple games and cheat codes, if you get a good one). At least the game will run at the speed it should run at consistently, whereas emulation, even on a good computer, can have timing errors, messing up the music note combo rhythms. Big jazz fan here. Is this stuff like a Japan only itunes kind of shop? Just wondering what bands and such he has there. Stop feeding. It will get you nowhere. Moreso than what the store is selling, it is nice to see that Itoi still has the Mother series on the brain. It’s also interesting that the page gets updated every day, with subtle changes in all the people standing around. Awsome didnt know about that music shop. That background music is so catchy! Anyone know where i could buy it from? Ness’s dad is on the first floor.